Hi Everyone! Books-n-Kisses and I are excited to have Author Annabeth Alberts with us today chatting about audio books. When I found out that my #gaymers series would be coming in Audio as well as e-book from Carina Press, my first thought was, “YAY!! !” and to muppet flail. My second thought? “How will I tell my mom?” And that brought on a whole different type of muppet flail. You see, my mother is the Queen of Audio Books. Growing up, she would put a book-on-tape on as she cleaned the kitchen late at night, and I can still remember the sounds drifting up to my bedroom as I read myself to sleep. She scoured yard sales (this was pre-eBay!) and our library for new books to listen to. Years later, I was an adult, and I was going through a particularly rough patch with a broken foot and a depression flare-up at the same time. She showed me how to use Overdrive to get audio books from the library, and I knit for hours and hours listening to Meg Cabot and Janet Evanovich as I healed, inside and out. My mother, however, remained the queen, deftly using Overdrive even as she collected the books-on-CD and books-on-tape that others were discarding as they went digital. Her personal books-on-CD and books-on-tape library is bigger than a lot of library’s physical collections, and still, all these years later, she still cooks and cleans with a book on. When my grandmother’s eyesight started failing, my mother made it her mission to find her audio books that she would enjoy. Whenever family or friends embark on long trips, she’s always fast with the audio book recommendation. Yes, Mom, they do. Shout out to all the amazing romance narrators, including my own who read the whole book, naughty bits most definitely included. And shout out to the library audio collections which kept my mother sane, my ailing grandmother entertained, and that one particular Fall, may well have saved my life. Want to keep up with my #gaymers series and other audio and e-book releases? I love hearing from readers (and listeners!) on social media! I've not read the series nor anything by this author! But... these sound good! Thank you for the giveaway! 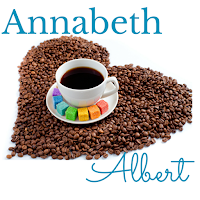 I love this series and all of Annabeth's books that I've read. I already read both books, but don't have the audiobooks. I can't wait for the third book, Connection Error. Love this series. I have not read the books but the audio samples sound great and I definitely will read them now! I haven't read the book, interesting audio sampler though. Look forward to reading the book. Thank you for the chance.